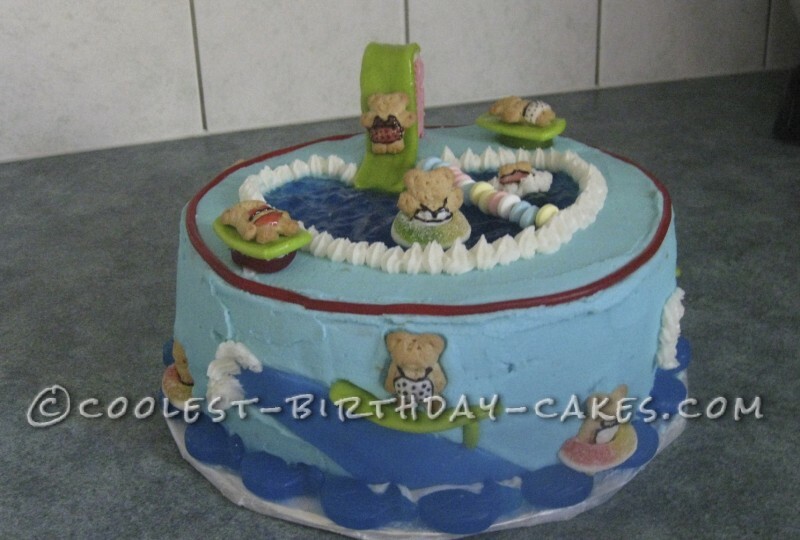 This swimming pool birthday cake took a lot of work. For my daughter’s birthday, she wanted to go swimming at the local pool with her friends. They had an area outside of the pool for presents and cake, so this is the cake that I brought. I started out by icing each individual teddy graham with a bathing suit. Very tiny work! Some had bikinis, some had one piece, and the boys had trunks! The cake was 2 layers of 8 inch round cake with part of the top layer scooped out for the pool. I iced the entire cake with a blue icing (including the bottom of the pool). I made some blue jello and allowed it to partially set before I poured it into the pool. It was then lined with candy necklaces including the line for the “deep end”. The slide, beach blankets, and surfboards were all made out of green airheads and the waves were blue airheads. Blue gummy whales lined the bottom and gummy rings were used for the inner tubes. 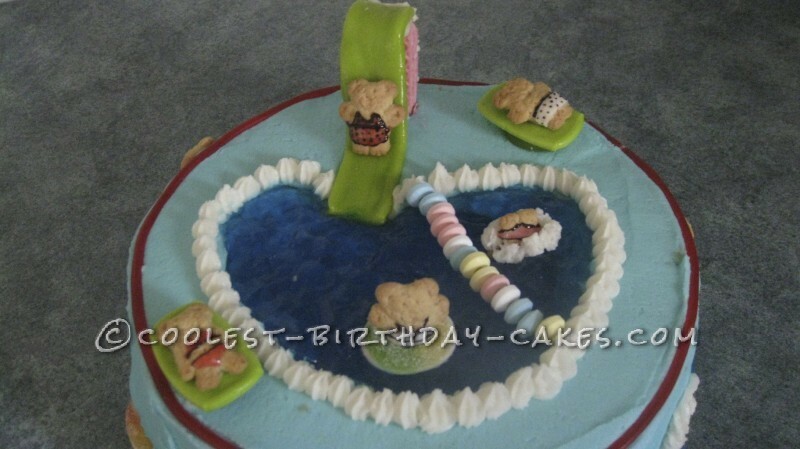 I used white icing for the splash of the teddy diving into the water and for the white crest of the waves. This cake was a lot of fun to make, but took quite a while. The kids were thrilled and the cake was delicious with the jello added. What fun!